Girls tend to be more affected by 'maths anxiety' than boys, according to a study which shows that teachers and parents may inadvertently play a role in a child developing the fear of numbers. Scientists at the University of Cambridge in the UK explored the nature and resolution of 'mathematics anxiety'. 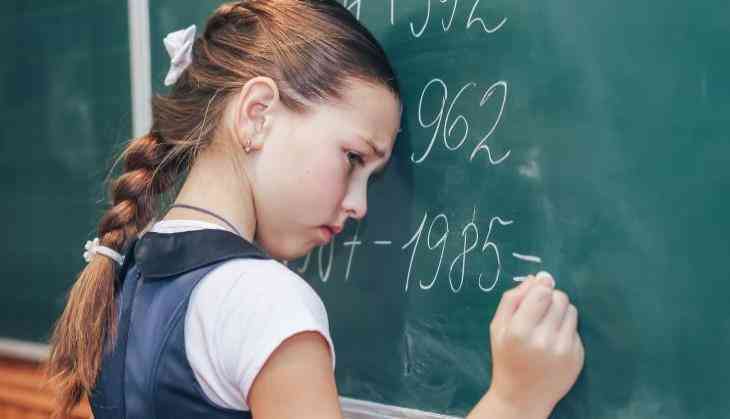 More detailed investigation in 1,700 UK schoolchildren found that a general feeling that maths was more difficult than other subjects often contributed to maths anxiety, leading to a lack or loss of confidence. Students pointed to poor marks or test results, or negative comparisons to peers or siblings as reasons for feeling anxious. "While every child's maths anxiety may be different, with unique origins and triggers, we found several common issues among both the primary and secondary school students that we interviewed," said Denes Szucs from the University of Cambridge. Students often discussed the role that their teachers and parents played in their development of maths anxiety. Primary-aged children referred to instances where they had been confused by different teaching methods, while secondary students commented on poor interpersonal relations. There was also greater pressure from tests and an increased homework load. Teachers and parents also need to be aware that their own maths anxiety might influence their students' or child's maths anxiety and that gendered stereotypes about mathematics suitability and ability might contribute to the gender gap in maths performance. "Teachers, parents, brothers and sisters and classmates can all play a role in shaping a child's maths anxiety," said Ros McLellan from Cambridge. "Parents and teachers should also be mindful of how they may unwittingly contribute to a child's maths anxiety. Tackling their own anxieties and belief systems in maths might be the first step to helping their children or students," said McLellan. The researchers said that as maths anxiety is present from a young age but may develop as the child grows, further research should be focused on how maths anxiety can be best remediated before any strong link with performance begins to emerge. क्या केरल का नया विधेयक आम आदमी से स्वास्थ्य सेवाएं छीन रहा है?